Hello from Phil and Chris Summers, co-owners of Spearfish Sports Academy. 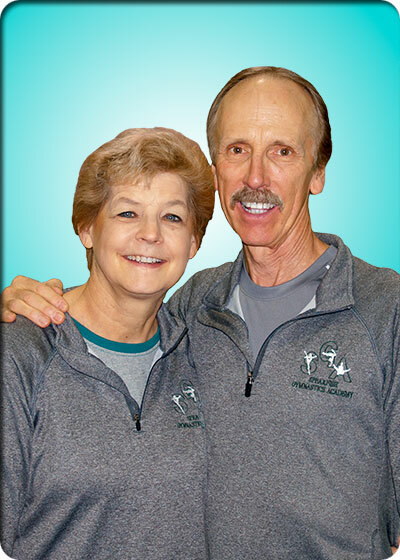 We moved to Spearfish from Michigan where we both grew up and began our interest in gymnastics. Myself through her experience in high school and Phil though the competitive program at Central Michigan University where he earned a Bachelor of Science Degree is Education. I continued my education at Ferris State University graduating with an Associate’s Degree in Dental Hygeine. Starting our coaching careers in Michigan gave way to a move to Washington D.C. for 5 years of experience coaching and running gyms in a far more advanced environment than was available in Michigan at the time. After this training period, we returned to Michigan to purchase and run our own gym for 9 years. Our club was very successful over the years. 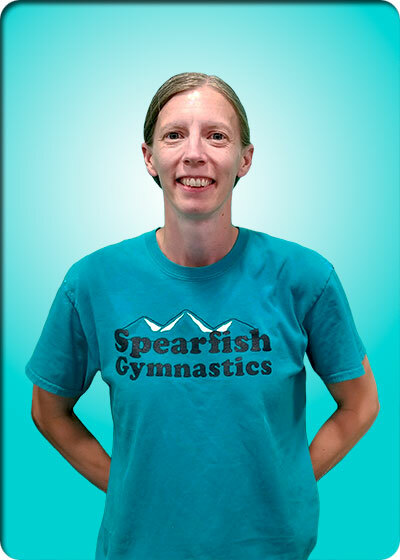 Our family took a vacation to Spearfish one summer and, upon returning, made the decision to move and bring gymnastics to this great community! 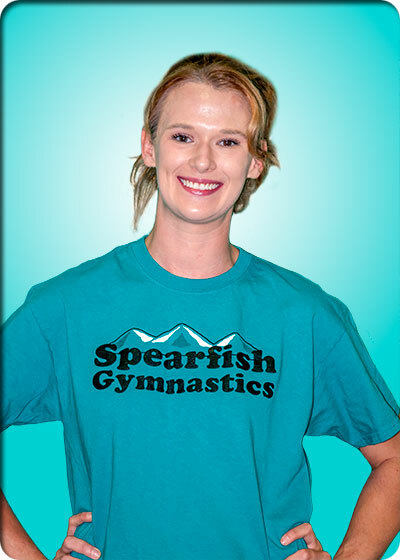 With that move Spearfish Gymnastics Academy was born! That was 24 years ago, and today, Spearfish Sports Academy proudly provides a unique experience to the children of Spearfish and surrounding communities. Phil and I have both been coaching gymnastics for 40 years! Together we have taught and coached all levels of gymnastics from pre-school, recreational classes, and high school gymnastics, all the way through the highest levels of the Jr. Olympic Program. We have produced many state, regional, and national award winners, and have numerous students earn full ride scholarships at Division I Universities. As exciting as all of that is, our love true love for gymnastics comes from working with all children and helping them develop a love for physical fitness! It is so awesome to see them gain strength, confidence, and character that will help them succeed in life long after they are done flipping in the gym! We love the Spearfish Community! My name is Lexie Cathcart, daughter of owners Phil and Chris Summers. Here at Spearfish Sports Academy I coach our competitive teams as well as Learning Tree Preschool. My husband John and I have three children, Zoë, Dakota, and Katana. When I am not in the gym I enjoy bike riding, gardening, photography, and spending time with my family! I have been involved in gymnastics since I was very young. My parents owned a gym in Holland, Michigan and by the time I was six years old I was a competitive gymnast. I competed for 15 years, first in Holland and then in Spearfish, South Dakota. I continued coaching so I could still be involved in the sport that I love. I have been coaching gymnastics for 20 years and have experience at all levels of the sport. I coached at two different successful clubs in Michigan before moving back to South Dakota. I also have an extensive background in dance and choreography. My name is Amber Speck. I have been coaching at Spearfish Sports Academy for 5 years! I coach the Xcel competitive team along with Gym Kids and Preschool classes. My gymnastics career started in Massachusetts when I was 3 years old. I started gymnastics at Tops USA Gymnastics and finished my 15 years of gymnastics at All Star Gymnastics. I also worked for 3 years at All Star Gymnastics coaching preschool, recreational, and competitive team through level 8. I moved from Massachusetts 5 years ago to attend Black Hills State University. I am an Elementary Education major working towards student teaching. I now live here in Spearfish with my fiancé and our two boxers. I can’t wait to share another great year gymnastics and fun! Hello! 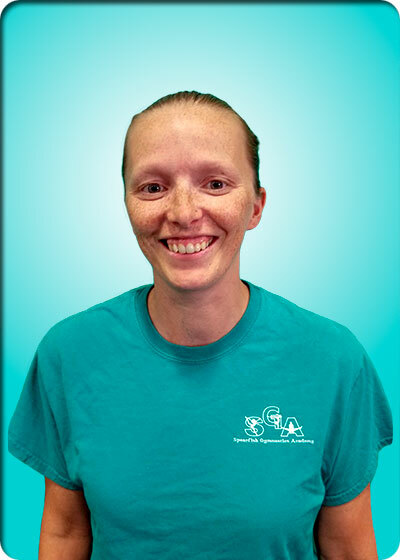 My name is Kayti Parish and I am excited to work with and get to know your child. I am from Gillette, Wyoming and currently attend Black Hills State University here in Spearfish. 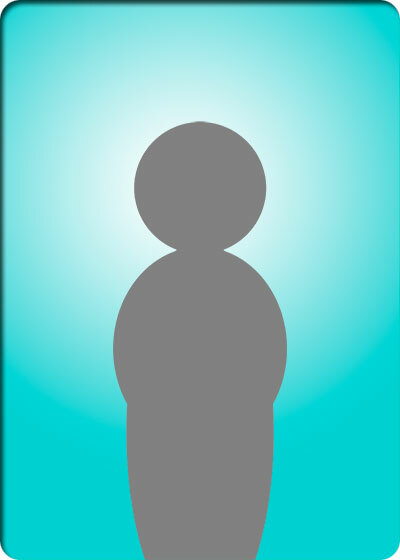 I am studying elementary education and special education and will graduate in May. Growing up I participated in gymnastics starting at age 4. For 12 years I lived and breathed gymnastics, and competed in the Junior Olympic program for seven of those years. In my free time I like to hang out with friends, hike, read and compete in Cowboy Mounted Shooting. This year will mark my tenth year of coaching, and I still love every minute of it! My favorite part is watching things click for my gymnasts. There is nothing more exciting than one of them getting a skill we have been working on tirelessly for weeks or months. My name is Veronica JenkinsI grew up in Wisconsin where my mom opened a gym when I was 4 years old. I do not remember a time when gymnastics was not a part of my life. Growing up in a gym my love for doing and coaching gymnastics came naturally. I spent 6+ years coaching before coming to Spearfish Sports Academy. I am excited to be back in the gym again and sharing this amazing sport with the next generation! I now live in Wyoming with my husband and two kiddos; Leland, who loves all sports, and Morgan who is a level 3 at SGA. When I am not in the gym I enjoy going hiking with my family and being outdoors. My name is Shelby Krueger-Woller. I am 25 years old and live here in Spearfish! I attended Black Hills State University and graduated with a Bachelors degree in Sociology. I love the great outdoors, traveling, and learning about different cultures and customs. On the average day you will find me in the woods or kayaking with my dog (best friend) Ruby, a very energetic Labrador. I try to travel to new places at least twice a year. My most recent trip was to Huatulco, Mexico where I enjoyed the beautiful coastline and was given the opportunity to release baby sea turtles into the ocean. I am looking forward to the fun and exciting gymnastics season. Make sure to bring your best smiles and be ready for lots of laughs and gymnastics fun! Hi! My name is Veronica Buchanan. 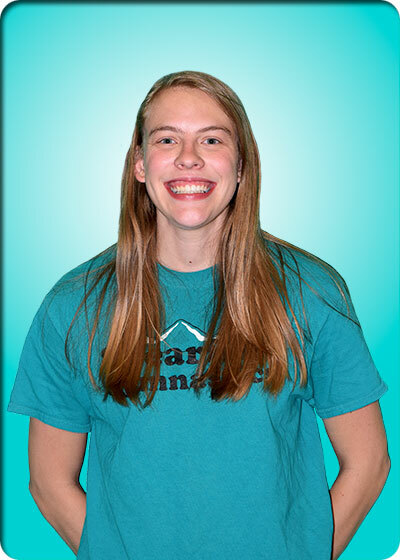 I’m 24 years old and a graduate student in Environmental Engineering at School of Mines in Rapid City, SD. I am also an owner of Gold Mine Pizzeria in Lead, SD. I participated in gymnastics until I was 12 and then got involved in cheerleading. I cheered on my high school team as well as my college team. I just recently started coaching at Spearfish Sports Academy; however, I have four years prior coaching experience at a few of gyms in Colorado. I very much enjoy working with kids and having the chance to be a part of their learning experience! I am looking forward to sharing a great year of gymnastics with them! My name is Josie Haden. I was born and raised in the small town of Hot Springs, South Dakota. 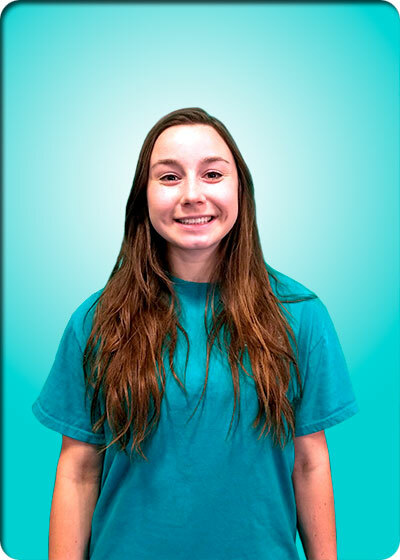 I am a freshman at Black Hills State University studying psychology! Gymnastics has been a part of my life since I was three. I was a member of the competitive team for Hot Springs High School from seventh grade up to senior year. Along with participating in gymnastics, I have also coached for the last 6 years. 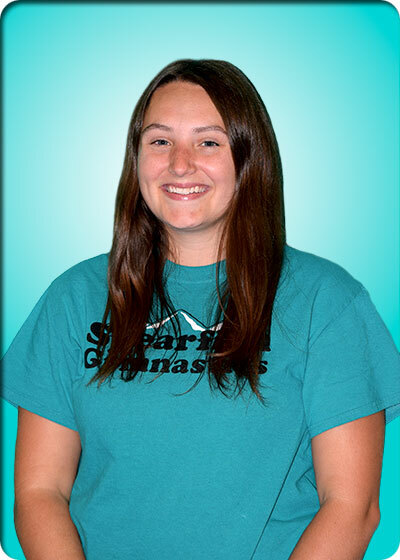 I worked as an assistant coach for Summer Rec Gymnastics in Hot Springs, and this past summer I got the opportunity to be the head instructor of the Gymnastics Program. This was such an honor for me and I loved every minute of being in the gym! I love gymnastics and am so pleased to have the opportunity share my love of gymnastics with your children! Outside the gym, I enjoy swimming, lifting weights, hiking, and almost anything that involves being active. I do, however, love watching a good movie for a relaxing night in. Being around kids is my real happiness though! I have been babysitting for many years as well as coaching because I can’t get enough of the positive energy kids bring to everything!